Here's a property tradin' game for farmers or those who just think farmin' is cool! It's life down on the farm where players increase their profit by collecting Acres and trading them in for Big Red Barns. 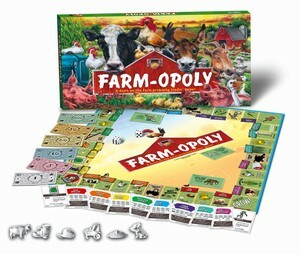 Full of country humor and fun farm facts, Farm-opoly is a celebration of an All-American way of life! Monopoly is a fairly entertaining classic board game centered on the theme of buying and renting out properties. The thing that makes Monopoly endure is its universal recognition - if nobody is interested in learning a game, and you're in a room of non-gamers, you might resort to playing a good ol' game of Monopoly. This particular board is barnyard themed, so suited for younger audiences or those with rural passion.